THIS IS THE ONLY ONE LIKE THIS IN STOCK... WHEN IT'S GONE, IT'S GONE! This sensational striped susti is not a dye or print but the product of a tight weave of black and white threads that create the perfect heathery gray! 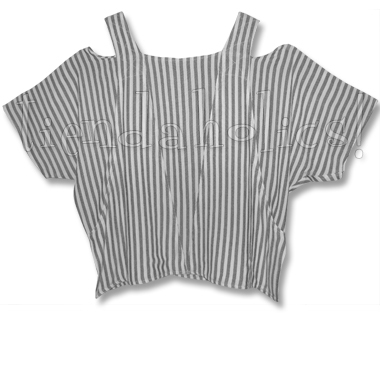 And this luxurious silver-striped susti is the star of this deliriously soft top... IN STOCK NOW! It's twilled and woven on traditional looms in Morocco, the YUMMIEST cotton/rayon susti (susdi), which I call the cashmere of cottons... if you don't know susti yet, you'll wonder how you lived without it!